After a great performance and a victory in the first competition of the FIS Nordic Combined Summer Grand Prix Finals in Planica, Mario Seidl of Austria is just a step away of claiming the overall 1st place. Finn Ilkka Herola finished 8th today and trails by 78 points. At 11.00 the Nordic Combined athletes went to the Bloudek giant jumping hill in cloudy Planica. With an excellent jump of 141.5 meters Seidl got a huge advantage before the second part of the competition, that is 57 seconds over Norwegian Espen Bjoernstad who landed at 133.5 meters. Third place was taken by Maxime Laheurte of France who started the 10-kilometer run exactly one minute after the Austrian. Rain started to fall just as athletes prepared to head to the roller track. Seidl effortlessly controlled the progression of the race and achieved his first victory of the season and with that fortified his lead in the overall cup standings. His teammate Martin Fritz, who was 8th after the first part of the competition, ran great and finished in second place with a 33 second deficit. Laheurte also managed to get to the podium and with that achieved best result of his career after 12 years. 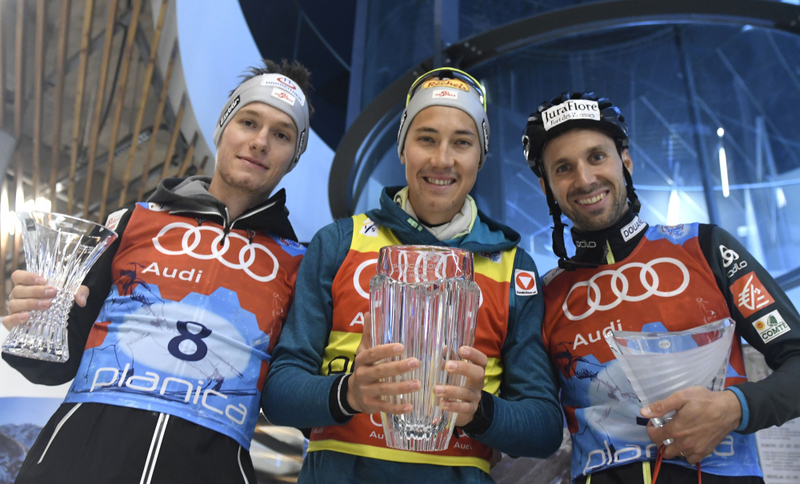 The best home athlete was Vid Vrhovnik, who took 15th place after the jump of 122 meters and concluded the first day in Planica as 19th best. Before the last race of the season Seidl has a 78 point advantage over Finn Herola, while Fritz is currently third.